Try one of our freshly made churros on us when you purchase any of our 12 rolled ice cream flavors on the House Rolls menu board, or with the purchase of our weekly special available from Wednesday through Sunday each week. 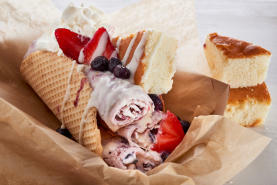 House Rolls offers flavors like the Gentilly, S'mores, Pralines & Cream, Bananas Foster and more. Weekly Specials are different each week but have flavors the the Girl Scout Thin Mint or Samoa Cookie Roll, the Carrot Cake Roll, and upcoming flavors like the Cotton Candy Roll or Candied Bacon and Pralines Roll.